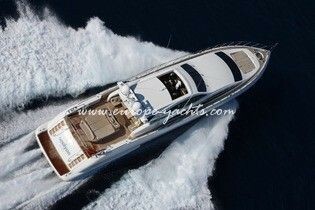 The stylish appearance of this sleek, sporty vessel with her streamlined form and curvaceous black windows makes Samira the object of many an envious look as she races through the water. 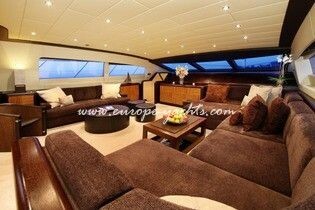 Clever design packs a heap of features into this yacht. 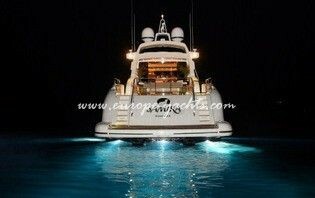 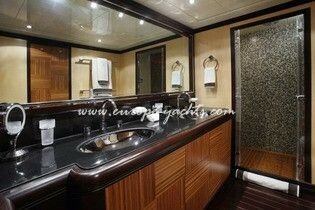 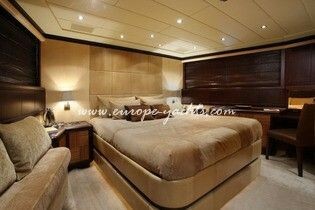 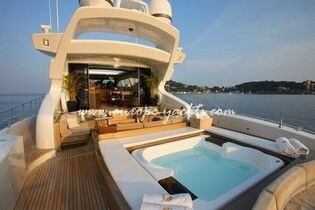 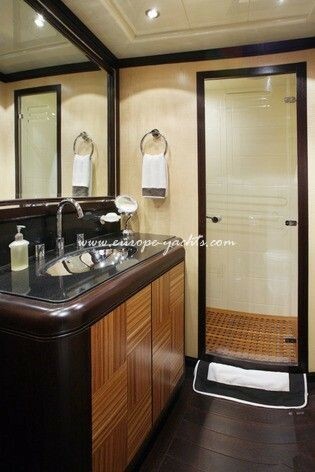 The aft deck, for instance offers a heated jacuzzi spa bath which, with its cover in place, doubles as a sunbathing bed. 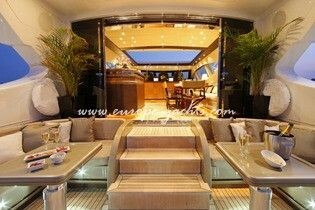 Just forward is a dining area and a pair of L-shaped settees on which to lounge the afternoon away, with the option of retreating through wide glazed doors into the air-conditioned comfort of the deck saloon if things get too hot. 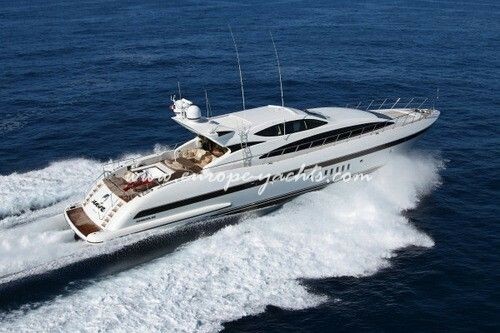 The Mangusta 105 Sport Samira benefits from the additional interior saloon forward of the driving position as well as the more usual “open” deck saloon aft, while still having the racy looks of an open boat. 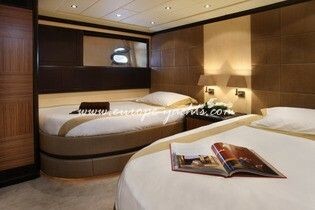 Below the saloon of the Samira are the three en-suite staterooms – all of them very well sized and eminently well decorated and comfortable. 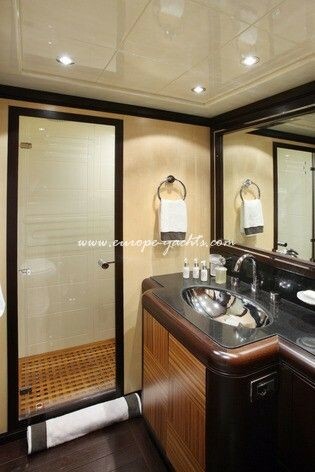 The double VIP cabin fills the bow, aft of which is a spacious twin, with oversized beds, while aft again the particularly spacious master fills the full beam, offering a twin-basin shower room, a walk-in wardrobe, settee and desk. 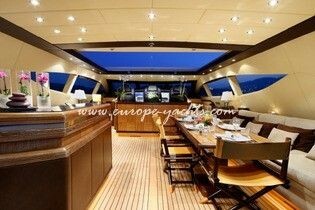 Not bad for a yacht whose horsepower-packed engine room fills almost a third of its hull. 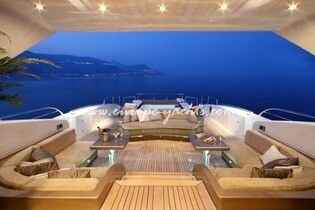 Whether sipping a cocktail under the stars, relaxing in the deck Jacuzzi or feeling the exhilaration of skimming the waves, this impressive yacht offers something for everyone.